Earlier I blogged how Archer Paranormal Radio was returning to Internet radio this week—actually tomorrow—on BlogTalk Radio. 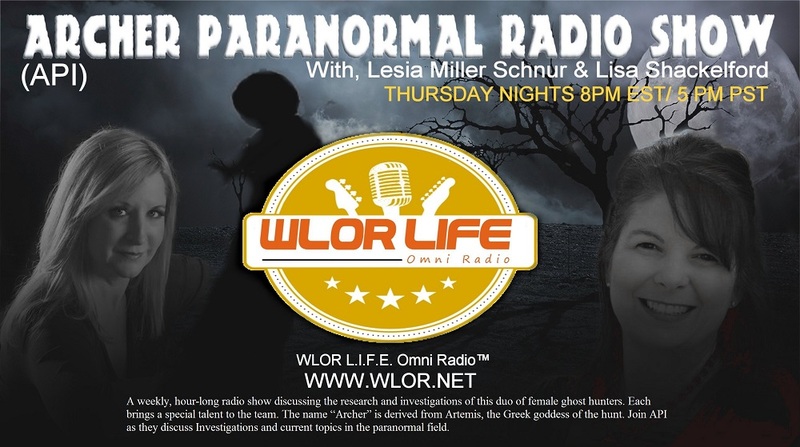 However, I have a new major announcement: The API Gals will debut Archer Paranormal Radio on WLOR L.I.F.E. Omni Radio, www.wlor.net, next Thursday, May 21st at 8 PM EST. We were offered an incredible opportunity to join a leader in Internet radio and we JUMPED! WLOR L.I.F.E. Omni Radio hosts experts in the paranormal field. Tony Wolf Paw, True Ghost Stories hosts Thomas Ryan and Adam Ginsberg, and The Unparanormal Paranormal Show with Mike and Lori Drum all have shows—and strong fan bases—on WLOR. Tune in as the API Gals discuss the paranormal field with an occasional guest dropping by.